In Understanding the Imaginary War: Culture, Thought and Nuclear Conflict, 1945-90, editors Matthew Grant and Benjamin Ziemann offer a collection focusing on how the unknowable and inconceivable – nuclear war – was necessarily imagined during the Cold War period. April Curtis welcomes this as a valuable contribution to understanding the cultural history of the Cold War that also serves as a reminder of its continued impact on contemporary international relations. 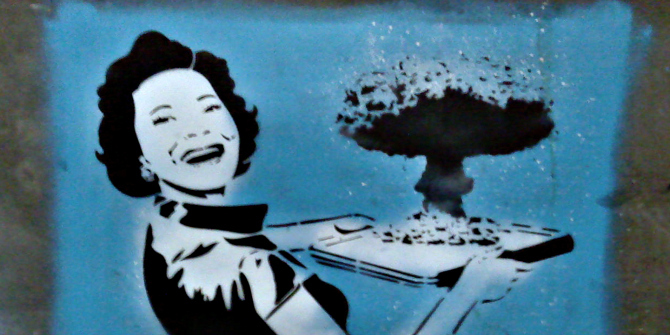 Understanding the Imaginary War: Culture, Thought and Nuclear Conflict, 1945-90. Matthew Grant and Benjamin Ziemann (eds). Manchester University Press. 2016. The world existed in a precarious state of duality during the Cold War. The United States and the Soviet Union, the only two superpowers, were both at war and at peace. Nuclear weapons — commonly shortened to ‘the bomb’ — made a nuclear holocaust feasible, and yet also served as credible deterrence against such an event. Understanding the Imaginary War: Culture, Thought and Nuclear Conflict, 1945-90, edited by Matthew Grant and Benjamin Ziemann, is a collection of cultural history essays exploring experiences of this unique duality. The book covers a wide breadth of communities and topics focusing on individual nations, such as Britain, the US, the USSR and Japan, as well as more narrow groups, such as the Catholic community, physicians, nuclear scientists and the imagery of nuclear war in US government films. 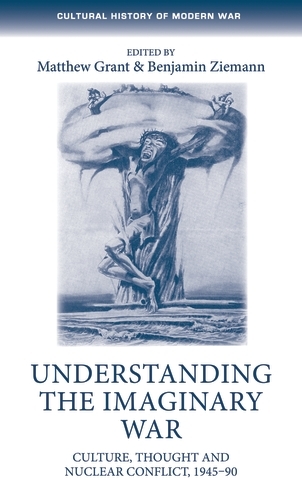 Although the volume covers a broad range of topics, the common threads connecting the essays are the themes of fear and imagination. Humans fear the unknown, and almost everything about nuclear war is uncertain as a war with the hydrogen bomb has never been experienced. Many of the authors elaborate on how different communities imagined such an event during the unique political environment of the Cold War and how this affected their attitudes towards the bomb. For European nations, a nuclear attack was largely framed through their experience of World War II. As Grant argues, Britain’s behaviour during The Blitz and its eventual victory in World War II, coupled with a robust civil defence programme, initially allayed the public’s fears. However, following the testing of the hydrogen bomb in 1952, other aspects, including scientific discoveries, images from nuclear tests and even science fiction, began to colour and change how nuclear war was imagined. Metaphors were another tool used to conceptualise the destruction that a nuclear war would bring. The world struggled to create a distinction between the known —conventional warfare — and the unknown — nuclear warfare. Scientists promised that a nuclear war would be more destructive than World War II, yet how this could be possible was difficult for the public to grasp. Jason Dawsey’s chapter on philosopher and anti-nuclear activist Günther Anders argues that in order to imagine what the war of the future would look like, it was necessary to turn to a book from the past: the Bible. Anders believed a gap had formed between technology and humanity’s ability to imagine the destructive powers of its own invention. Despite not being religious himself, Anders used religious apocalyptic eschatology in order to bridge this gulf as the Bible’s imagery seemed the only thing capable of conceptualising the devastating potential of nuclear war. He hoped that if humanity was able to imagine nuclear war clearly, nuclear weapons would be eliminated. Dawsey’s essay provides an excellent juxtaposition with Daniel Gerster’s essay on Catholic anti-communism in West Germany and the USA. Here, Gerster argues that Catholics who spoke out against nuclear weapons rarely employed apocalyptic imagery, but instead kept their arguments abstract in order to increase their credibility. Public opinion of nuclear weapons changed over time, and this collection does a particularly good job of tracking the development in attitudes. Paul Rubinson’s article on Carl Sagan’s nuclear winter theory, developed in the 1970s and 1980s, marked an important change in the public’s perception of nuclear war. His theory claimed that after a nuclear attack, fires would spread, creating tons of smoke and soot that would eventually block out the sun. A few weeks after the initial attack, the earth would cool to -15 to -20 °C, which would halt all agriculture growth, resulting in mass starvation. This theory was based on data from dust storms on Mars and tested in relation to Earth’s unique conditions using a computer model. Sagan’s model received significant attention from scientists, politicians and the general public in both the west and the east. Although it came under harsh criticism, his theory bridged the gap between the imagined and a scientifically reliable prediction of nuclear war. The nuclear winter theory changed nuclear war from an abstract, general fear to a tangible image of the extinction of the human race. At a time when the US government claimed nuclear war was survivable, Sagan’s theory brought together anti-nuclear war and human rights activists as well as environmentalists, and supported their abstract arguments against nuclear weapons with peer-reviewed scientific evidence. The benefit of an essay collection is that in-depth chapters focusing on individual nations, religious groups and other communities allow for a more comprehensive presentation of the era rather than just a simple overview. However, while no volume is likely to be considered fully complete, a chapter on how the West imagined the characteristics and values of the people and politicians of the USSR, and vice versa, would have been a useful addition. Due to the inability of the two populations to communicate, the public and politicians on the other side were unknown, and therefore largely only able to be imagined. Furthermore, the mystery surrounding the other side’s intentions and values played a major role in uncertainty about ‘the enemy’s’ willingness to launch a first attack. The fear surrounding the ‘if, when and where’ of an opening strike therefore deserves attention. This volume on the cultural history of the Cold War is an important addition to the study of the period more generally. Cultural history is an important aspect of political history because in the west, the people voted in their leaders. Therefore western leaders, and the platforms on which they ran and won, are a reflection of the hopes and fears of the population during the time period. Even behind the Iron Curtain, citizens still had some sort of agency, albeit less than in the west, and their opinions on nuclear war, especially after the Chernobyl disaster in 1986, had an effect on the Soviet government. Everyday citizens are important actors in the creation of history and are therefore worthy of academic attention. Understanding the Imaginary War is useful both as a historical tool, but also as a reminder that nuclear weapons still exist, and that nuclear war is still a very real possibility. If anything, the current political situation between Russia and the United States, and especially the inclusion of Article 27 in Russia’s 2014 Military Doctrine relating to the possibility of using nuclear weapons to respond to a conventional attack, shows that emotions felt during the Cold War still affect contemporary relations. April Curtis received an MSc in History of International Relations from the LSE. She is currently working at NATO Headquarters focusing on the Alliance’s relations with Russia and Ukraine. Read more by April Curtis. Good timeiing of your analysis with North Korea on the World’s Minds!